DON'T BE FOOLED BY GMOS!!! 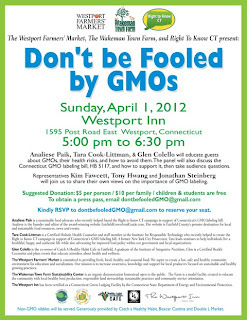 PLEASE JOIN RIGHT TO KNOW CT, THE WESTPORT FARMERS MARKET, THE WAKEMAN TOWN FARM, ANALIESE PAIK, GLEN COLELLO AND MYSELF AS WE DISCUSS GMOS AND WHY GMO LABELING IS SO IMPORTANT. 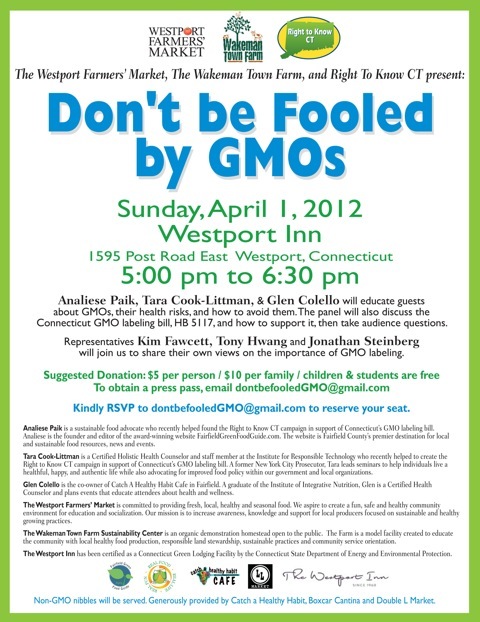 CT LEGISLATORS TONY HWANG, KIM FAWCETT AND JONATHAN STEINBERG WILL ALSO BE THERE TO TELL YOU WHY THEY SUPPORT GMO LABELING. I am taking a short break from GMOs to address Pink Slime because so many people have been asking me about it. While pink slime and GMOs may seem totally unrelated, they actually have a lot in common. There are a couple of recurring themes. First of all, the government is messing with our food supply without our knowledge or consent and in many instances Americans are becoming ill because of it. Secondly, pink slime and GMOs are symptoms of a larger problem, Americans are disconnected from their food supply. Do you know where your food is coming from? When was the last time we saw the farm where the animals we eat are raised or the slaughter house where they are killed or the meat processing plant? When was the last time an average American was allowed to stop by a Kraft manufacturing plant to see where their food is being processed and packaged? Americans are removed from our food supply and so we don't think about where our food comes from, and thus, it follows that we don't really know what is in our food. This problem is exacerbated because big companies don't want us to know what is in our food because then they know we won't buy it. For anyone that has missed the pink slime headlines, the definition of pink slime on wikepedia is as follows: "Boneless lean beef trimmings refers to an industrial product created from beef trimmings using particular processes; these products are occasionally referred to using the neologism pink slime. These processes, which include meat trimmings passing through a centrifuge, and (in the most common process) being exposed to ammonia gas, have drawn attention as the subject of possible health and consumer concerns. The term pink slime was coined by Dr. Gerald Zirnstein to refer to the resulting products." In essence, pink slime is the leftover crap mixed in with some ammonia to kill bacteria that no one in their right mind would choose to knowingly eat. More specifically, pink slime is a combination of fat, sinew, and bloody effluvia. Until ten years ago, these animal waste products were sold primarily for pet food. Somewhere along the way someone had the brainstorm that they could mix this waste with the beef to produce a cheaper product. Yet another example of greed and lack of care in our government and big business. So, of course the next question is, how do I avoid meat that contains pink slime? Just like GMOs, there is no labeling system in place giving the consumer the right to know what is in their beef or the right to choose whether to buy pink slime infested beef. Before pink slime became headline news, it would have been quite difficult to avoid it. A 2012 ABC news report estimated that 70% of ground beef contained pink slime. If you are a hamburger loving person that buys your chopped meat from the supermarket, or eats hamburgers and other chopped meat products such as chili at a restaurant, then chances are you have ingested pink slime. Supermarkets across America are now coming out with statements that they will not sell meat with pink slime. Please see this website which lists stores and what their position is on pink slime. http://blog.timesunion.com/hottopics/who-sells-meat-with-pink-slime-heres-the-list/8877/ I can not speak to how accurate or up to date this list is, but wanted to pass it along for you to see. The USDA announced that school districts will be able to opt out of buying meat that has pink slime in it. Isn't that so nice of the USDA? Seriously, is there a school system in this country that would choose to buy the ammonia treated pink slime meat? Fairfield Public Schools have already announced that they will not be purchasing the pink slime meat. Thank you Fairfield! Why is the USDA even allowing pink slime to be used at all? Maybe someday school systems will be able to opt out of buying meat with hormones and antibiotics. 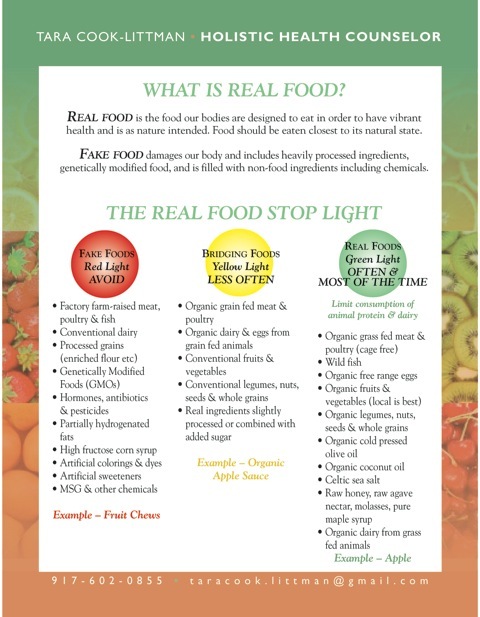 The best way to avoid pink slime is to reconnect with your food and make sure it is real! Know where your beef is coming from. When eating at a restaurant or buying your meat ask if it has been mixed with pink slime, and if you can not get a fast, straight forward answer, do NOT eat that meat. Shop at a place like Double L in Westport where LLoyd, one of the owners, speaks with the farmers that raise and process the meat he sells. http://www.doublelmarket.com/ Buy your meat at local butchers who grind their own meat. That is what our grandparents did. I know people are already thinking about the cost of buying beef like this. Meat is NOT supposed to be cheap and it is NOT supposed to be eaten often, if at all. So, if you are going to eat meat, buy high quality meat and eat it less often and in smaller quantities . In the alternative, you can buy your cheap meat and pay for your Dr. bills later in life. Don't forget there is always the option of not eating meat products at all. I am truly perplexed and angry at what has happened to our food supply. If nothing else, hopefully pink slime and GMOs are making us think about what is happening to our food. We need to wake up and stop accepting the status quo. Start asking questions about your food, it is your right to know what is in your food. If you ever get confused about what to eat, just remember, keep it basic and keep it real. If you are local, please attend the Food For Though Expo on March 31st from 10 AM - 4 PM at Andrew Warde High School in Fairfield. Food For Thought Expo is sponsored by the Fuel For Learning Partnership, a PTA Council Committee, that through education and advocacy is working to improve the quality of food served to our children in the Fairfield School Lunch Program. Michelle McCabe has been the talented, strong leader of the Fuel for Learning Partnership for the past three years. I am honored that in September I will be Michelle's successor. I have very big shoes to fill! Thank you Michelle. Microwaves take real food, make it taste terrible, destroy the nutrients in the food, and turn it into fake food. Dehydrators, on the other hand, take real food, make it taste fantastic, preserve all the nutrients and enzymes in the food, and keep it real! When you get rid of your microwave it will open up enough counter space for your fabulous new dehydrator. Read on . . . . I had contemplated getting rid of my microwave for over a year. One afternoon a few months ago, I finally got up the courage to get rid of it. I warned my husband that the microwave was going to go missing one day. I think he thought I was just teasing him. While I am used to eating cold or room temperature food because of my love for raw food, my husband likes his food hot. So, when I cook dinner at 3:00, and then he doesn't eat until 8:00, he always reheated his food in the microwave, while I happily ate my food cold. My husband's temperature preferences aside, once I finally felt fully motivated, I ripped the plug out of the outlet and carried the microwave to the basement where it remains today. I can't bring myself to donate the microwave because I don't really want to pass on this dangerous household appliance to anyone else. I felt so accomplished. I stood back, looked at the empty space on my countertop, and smirked, much better! Now my husband complains about eating cold food or waiting 30 minutes while his food heats up in the oven, but don't feel too badly for him, he is eating home cooked meals practically every night! Have any of you ever wondered if your microwave is actually safe? Have you ever moved away from the microwave while it was on because your instincts told you to move? For all you ladies who were pregnant, weren't you told to stay out of the line of a microwave? Have you ever eaten food cooked or heated in a microwave and the taste is totally changed? What does your gut tell you about microwaves? My gut always told me there was something unsafe and unnatural about them. Turns out my gut is right. We all question whether microwaves are safe, but like everything else in this world we always assume someone else is making sure we are safe, so if microwaves are being sold, we rationalize they must be fine. They are NOT fine and no one is really watching out for us. Microwaves change the molecular structure of foods, destroy most of the nutrients in food, and can cause severe immunological problems when used over a prolonged period of time. Rather than listing all the dangers microwaves present, I suggest you do a little of your own research and you can start by reading this article. http://www.globalhealingcenter.com/health-hazards-to-know-about/microwave-ovens-the-proven-dangers In truth, we all know we shouldn't be using microwaves but because of the convenience factor, we dismiss our natural instincts. When you decide to get rid of your microwave, here are a few real life tips that will help you figure out how to reheat food and do other things that you used to do in your microwave. These tips are so simple, it's almost embarrassing to list them, but that is exactly the point. Everything we do in a microwave can easily be done without a microwave. (1) Reheating Food - Put the food in an oven safe dish and heat at 350 degrees until food reaches desired temperature. (2) Steaming Vegetables - Put your vegetables in a steamer basket and place basket over a pot filled half way with water. Boil the water and allow the vegetables to steam until they reach desired consistency. (3) Defrosting Food - Take food out of the freezer a few hours before you plan to cook it. It will defrost on the countertop, just plan ahead a little bit. (4) Heating Water - Put the water in a pot and heat. I think you get the picture!!! So now what are YOU going to do with that counter space left vacant by the microwave now sitting in your basement? My suggestion, get a dehydrator! Dehydrators take up about the same amount of space as microwaves but rather than destroying food like microwaves do, they allow foods to keep all their vitamins, minerals, and nutrients when dehydrated at a temperature of 115 degrees or lower. I LOVE my dehydrator and so do my kids. Dehydrators are fool proof. Anyone can dehydrate food because you simply place the food on the dehydrator sheets, set the temperature at 115 degrees, plug it in, and leave it there until the food reaches the desired consistency. I usually put the food in at night and then in the morning the food is done. What could be easier? What types of food can you make in a dehydrator? Our favorites are kale chips, dried fruits, flax crackers, and zucchini crisps. There are great recipes all over the internet for dehydrated food. But, truly there is no need to get fancy. Toss your kale with some olive oil, celtic sea salt, and a little nutritional yeast for a cheesy flavor and I promise they will be a hit with adults and children. I can not keep up with the kale chip consumption in my house. I have the excalibur dehydrator and I do believe they are the best on the market. Everyone is always asking what to give their kids for snacks. Kids and adults both love to munch on crunchy things, the problem is that most snacks in the supermarket are overly processed and filled with fake ingredients. Dehydrating your own food is one way to keep healthful snacks around.